Summer time, freshly cut lawn, long days, a spring in your step and the smell of smoked meat in the air. What bliss! But I know what you’re thinking, a lot of hard work, sweat and tears goes on behind the scenes of that delicious meat-smoking process, but that could all be a thing of the past with the right equipment by your side. Yes my friend, you need an electric smoker. Why? Quite simply put, electric smokers have made smoking so much easier and still achieve that authentic smoky taste that everyone loves. 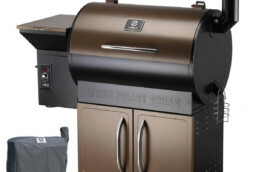 There is so much competition out there when it comes to picking an electric smoker, lots of reviews to read and information to digest, so I have taken the liberty of putting it all together for you in this article, which will help you to pick the best electric smoker. I will go on to discuss the advantages of using one (for if you’re not so familiar with them), discuss how they are to be used and finally a review of 10 of the best electric smokers out there. You may still be wondering why should I purchase an electric smoker? There are so many pros when it comes to electric smokers and here are just four that I think make electric smokers so worthwhile that will save you time and effort. The first being just how easy they are to use. As you know, traditional smokers require igniting a fire and constantly adjusting the temperature. On the other hand, all that’s required with an electric smoker is for you to plug it in, choose your temperature and Bob’s your uncle. It’s that easy. There’s also a quite important safety element to consider. As mentioned above traditional smokers require lighting a fire, which means open flames in your yard, which is all well and good until the family arrive and small children are about, as you can imagine that could get dangerous. That is why electric smokers are so much safer as they don’t use open flames. Another one is the sheer cost of using a traditional smoker. Buying the sufficient amount of charcoal and wood for your smoker is pricey, whereas electric smokers only use electricity and while their consumption levels are quite low, this means that you won’t be racking up an expensive bill at the end of the month. Lastly, electric smokers are just so much more convenient, as you don’t have to sit around looking after the fire as you would with a traditional smoker. Just simply plug it in and let the smoker do all the hard work for you. Leave the instruction manual to one side and follow these easy steps to help you use your electric smoker, it couldn’t be simpler, promise! So before you do anything else make sure your meat is seasoned up and ready, this will give your food a wicked flavor when it is done. Next, adjust the temperature on your smoker, make sure you do this before adding your wood and water. Then slide in your water, (the water evaporates during the cooking and helps to keep your meat succulent and tender) close the smoker. Slide in your wood. When you’ve got a good smoke going add your previously prepared meat to the smoker. Keep adding more wood chips as they burn down. Make sure you check your meat temperature with a thermometer to make sure it’s all cooked properly. Some smokers come with a built-in thermometer which makes life so much easier. Add a finishing sauce to your meat just before it is done to give it a more intense flavour. Take the meat off the smoker and let it rest. Slice it up and enjoy! So maybe you’re an expert at smoking beef and pork but you’re not quite so confident when it comes to poultry, but don’t worry. Smoking chicken doesn’t have to be a complicated process and just to prove it, here is a clear guide that will help you to make the best smoked chicken on an electric smoker. First things first, seasoning. Grab hold of your favorite BBQ chicken spice and go to town, you want your chicken to have that great smoky flavor that will knock everyone’s socks off! Set the temperature of your smoker. Keeping it between 250 and 275 fahrenheit works a treat. Add the wood to your smoker, good quality wood will enhance the flavor of the chicken. Smoke the chicken until the internal temperature of the leg reaches a toasty 165 degrees fahrenheit. Don’t forget to let the chicken rest before slicing it up as this draws the flavor and juices back into the meat giving it that fall-off-the-bone texture that everyone is nuts about. Carve it up, sit back and enjoy the fruits of your labor. Now isn’t that easy peasy, lemon squeezy? Now, I know what you’re thinking, you’re committed to buying an electric smoker, but with so many makes and models out there you are wondering which would be the best one for you to get your hands on. Individually looking up all the specifications and reading reviews can be quite tedious, so you will be pleased to know that it is all in a handy list below. Here is a list of my top ten electric smokers and some of their outstanding features which will help you make the best decision when picking an electric smoker. 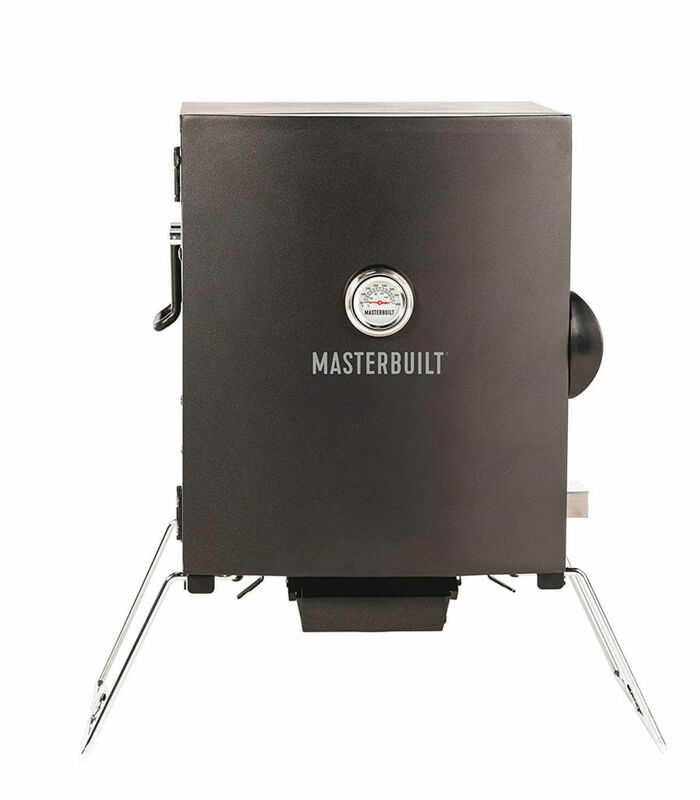 So I’m starting off with this fantastic Masterbuilt electric smoker and it raises the stakes high as it has a few specifications that I think make it really special. This is really important as when the sun glares on the smoker, it can be quite difficult to read the temperature or check up on your cooking time on many electric smokers, so the blue led makes these numbers easy to read even in direct sunlight. Sun’s out, shades on! 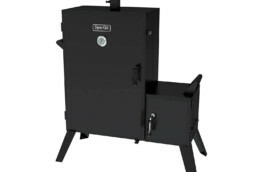 Another great feature is that this smoker also comes with a handy remote control that monitors the temperature, time, internal light, power on/ power off button and meat temperature all at the press of the button. How do you fancy smoking meats from the comfort of your lawn chair with a beer in one hand and the remote in the other? 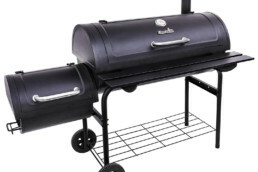 This doesn’t have to be mere wishful thinking, turn your dream into a reality with this smoker! Power on! No one likes over-cooked tough meat and it can be quite difficult to keep checking on just how hot the fire is when juggling setting up lawn chairs and entertaining guests. But the good news is that it has never been easier to monitor temperatures with this Char-Broil smoker. 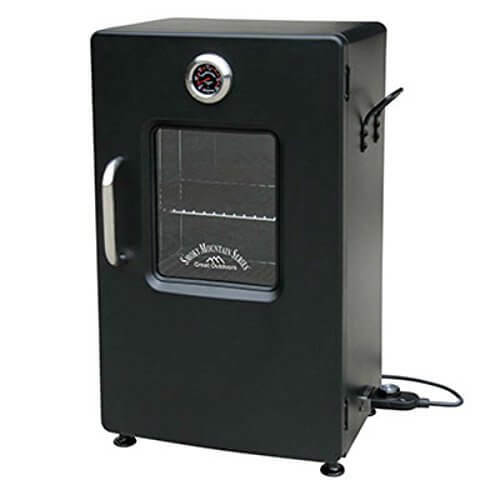 This smoker comes with a door-mounted temperature gauge so that you can easily monitor the internal temperature of your smoker. The gauge is white and its display couldn’t be simpler to read. If you are like me than you probably think that smoking meat is really fun however cleaning up afterwards can be the worst and most tiresome part of the smoking process, but with the right materials like this smoker has, it can be as easy as one, two, three. 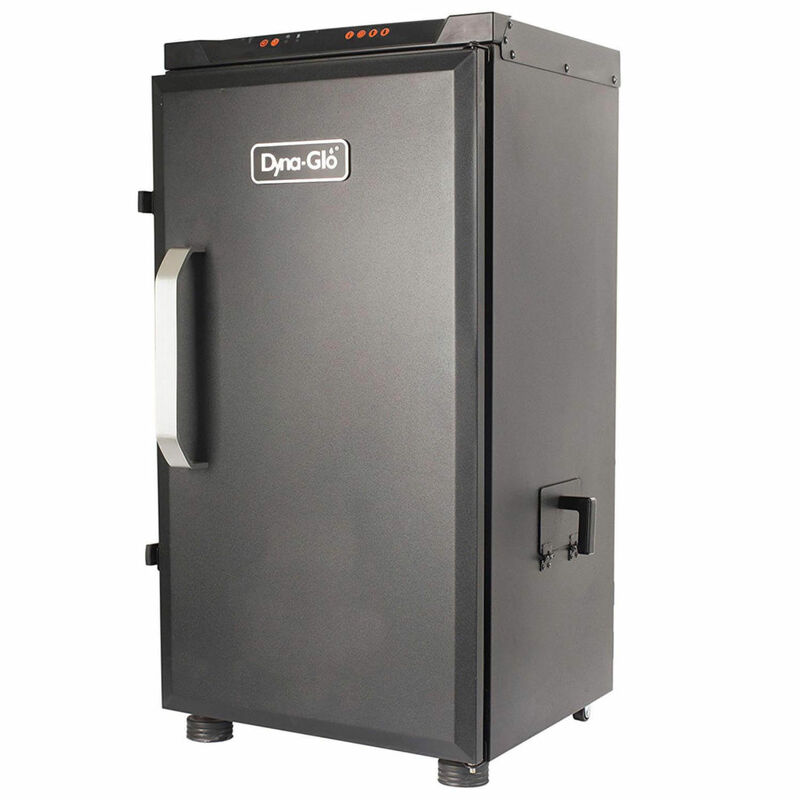 This Dyna-Glo electric smoker is solid. And I mean really solid. Electric smokers use electricity and with electric bills rising, the last thing you want is a energy-sapping smoker sat in your backyard. That’s why I love this smoker as it has so many heat-retaining energy efficient plus points that will make your wallet leap for joy. You may feel like most smokers waste a lot of energy and produce a lot of heat that easily escapes into the atmosphere, and let’s face it, who wants to pay to heat up the air in their backyard? 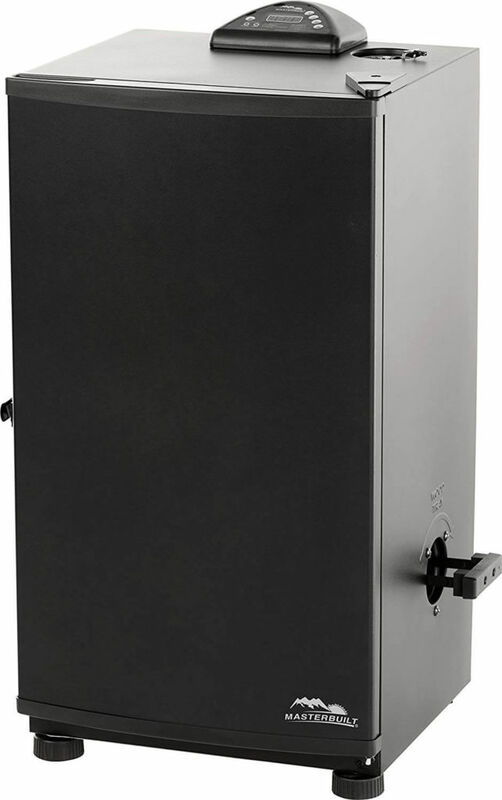 That is why this smoker has a cleverly crafted insulated double-wall firebox and a high-temperature door seal that helps it to retain its heat and smoke for much longer. 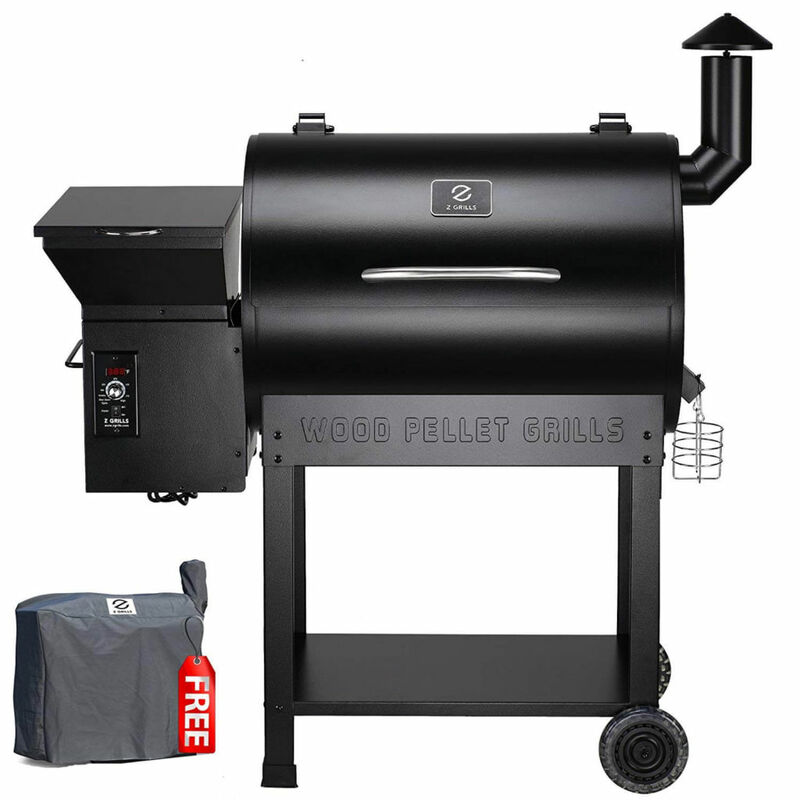 This smoker also employs a side access wood chip loader that not only makes it easier for you to add extra wood to the smoker but also minimises heat loss. That means you don’t need to waste heat everytime you want to add heat, now that is clever, right? Are you planning the next summer BBQ with the family? Well, you are going to need a smoker that is big enough for the job but don’t worry, I think you have found it. There’s nothing more tiring and laborious than sitting around and waiting for meats to be cooked so that you can put the next batch in. I know what it feels like when all eyes are on you and hungry bellies start to rumble but the first batch of sausages still looks insipidly pink. 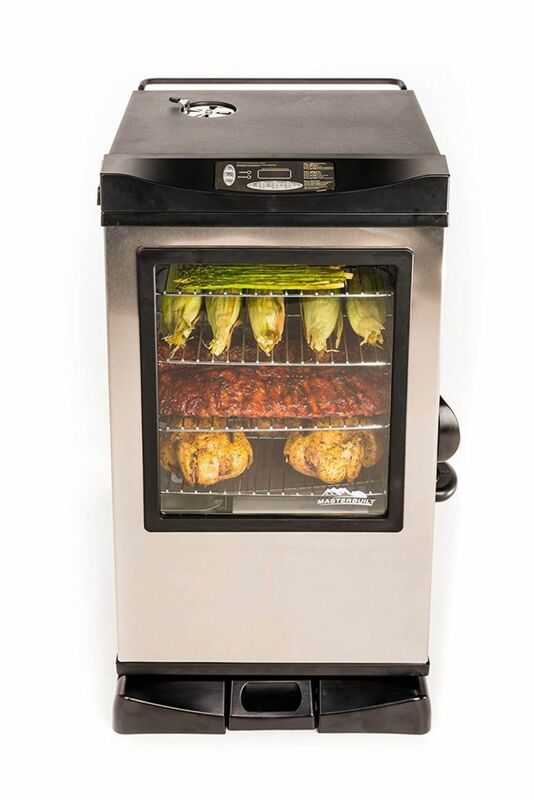 Having a smoker that has ample cooking space is crucial and this Masterbuilt electric smoker has four chrome coated smoker racks with space to cook up to eighty pounds of meat, now that is tasty news! This electric smoker also has a digital panel on the top which can be used to turn the smoker on and off. 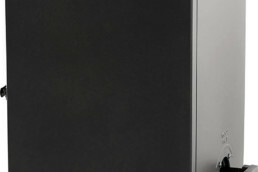 The panel also has other buttons that allow you to easily adjust the temperature and time of the smoker. Are you looking to add more flavor to your BBQ meat but you just can’t seem to get the seasoning right? Let me let you in on one of the tricks of the trade. You will be intrigued to know that the most scrumptious smoky flavors aren’t just down to having a good pot of meat seasoning in your kitchen cupboard, it also has a lot to do with water retention. The secret is in the water bowl and this Smoke Hollow electric smoker comes with a removable water bowl which really is essential to sizzling up great tasting meat. The water bowl is placed in the smoker before you add your meat and the water evaporates while your meat is cooking, this helps to keep it from drying out, making it more supple and tender, allowing the seasoning to seep deeper into the meat resulting in a more intense flavor. This fantastic feature will make all the difference to your next summer BBQ. So go on, give it a try! Are you the travelling type? Do you love the idea of putting your smoker in the back of your truck, loading up on fresh meat from the butchers along the way and stopping wherever you like to prepare a BBQ? Or maybe you love the idea of smoking meat in the backyard with friends and family around but are sick and tired of looking at the same corner of the garden all summer round. If that sounds like you then this Masterbuilt electric smoker will be perfect. With this electric smoker it is no longer necessary for you to stay in the same place as it is portable. 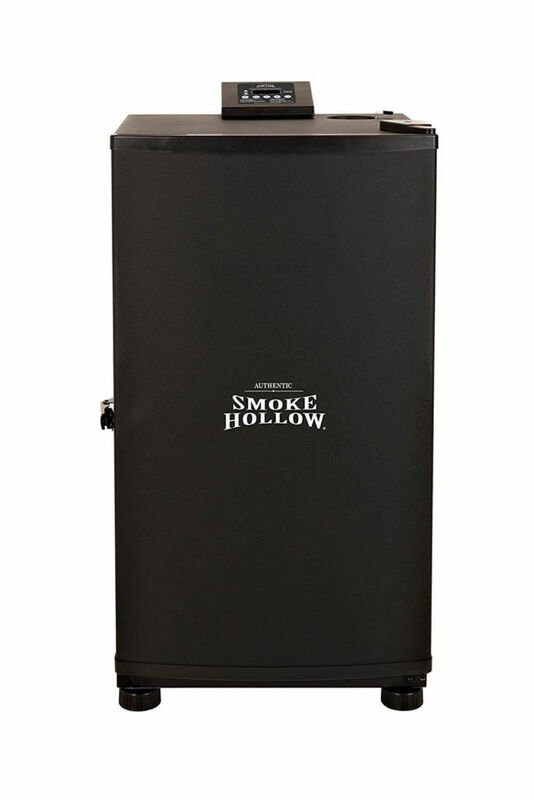 This smoker has a compact design and folding legs that make it easy to store and take away on the go. 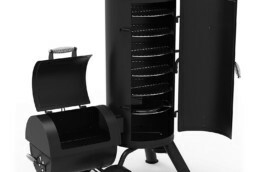 Ok, so maybe you won’t be able to cook for the entire neighborhood with this smoker as it only has two smoking racks, but the portability of this model make it a popular choice for those who want to get up and smoke on the go away from the hustle and bustle of the city at the drop of a hat. 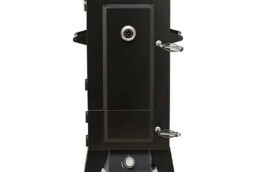 I know what you are thinking, electric smokers are big and bulky and not at all practical for moving around.While that may be the case with the many mediocre, jack of all trades master of none electric smokers that are on the market today, it is certainly not the case with this model. 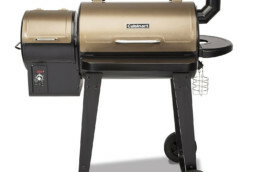 This LANDMANN electric smoker has a really neat design, it only weighs 33 pounds and comes with wrought iron side handles which make it a lot easier for you to transport across the yard. That means no more back-breaking heaving for you, nice. This smoker will get the job done properly no fuss, no flap, as it has a three-in-one combination tray and high quality chrome plated cooking racks ready to gently sizzle the finest cuts of your seasoned meat. Smoking meat doesn’t have to be complicated, stressful work and this electric smoker lives up to that. Other great features include a variable temperature controller and a heating element which makes things so much simpler. I don’t know about you, but I’m all about making life easier. I’m just not cut out for hauling heavy machinery across the lawn in the hot sun and quite frankly, I don’t think anyone is. That’s why I love this Smokin-It electric smoker. It was designed to make smoking easier and to make transporting a smoker a walk in the park. This smoker comes with nifty side handles and wheels to make moving it ten times easier than on other electric smoker models. Kiss goodbye to the normal heave-ho ritual as this smoker will glide effortlessly across your decking. There will be no more embarrassing fights between the children for the last lonely burger or chicken drumstick as there is ample space on this smoker for you to cook up a storm for the whole family. The Smokin-It electric smoker comes with three removable shelves and the capacity to hold up to 21 pounds of deliciously marinated meat or seafood, now there’s a tasty solution! Why have a smoker that can do just one job, when you have one that can do eight? It may seem too good to be true, but trust me, it’s not. This smoker is simply awesome. 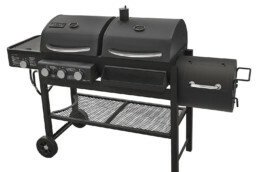 This Z Grills smoker is really an all-rounder, not only does it smoke, but it also grills, bakes, roasts, sears, braises, barbeques and char-grills. All of that potential inside one nifty bit of machinery, superb! 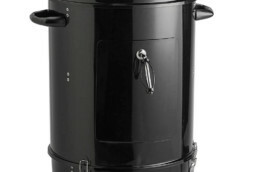 No one likes cleaning a sticky and greasy smoker and that is why this smoker is great as it facilitates clean-ups with its specially designed oil collector that waste oil drips into during the smoking process so that all you have to do is open the hatch and empty the container into the trash. 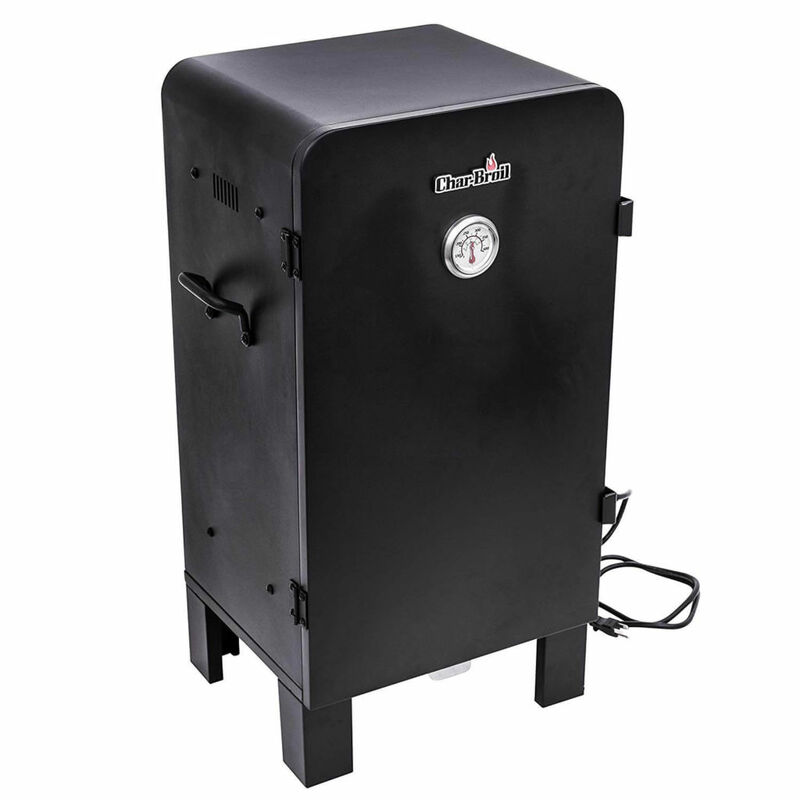 What I love about this smoker is its versatility, it even has a temperature and pellet feed control system which means you don’t have to stand around monitoring heat levels. So just sit back and relax! Oops, you inadvertently invited the whole family over to try your secret recipe BBQ seasoned chicken that you have been raving about since last summer. Not to worry, with this Cuisinart electric smoker you will have the cooking space to tend to all the family, keep bellies full and taste buds tingling all afternoon long. 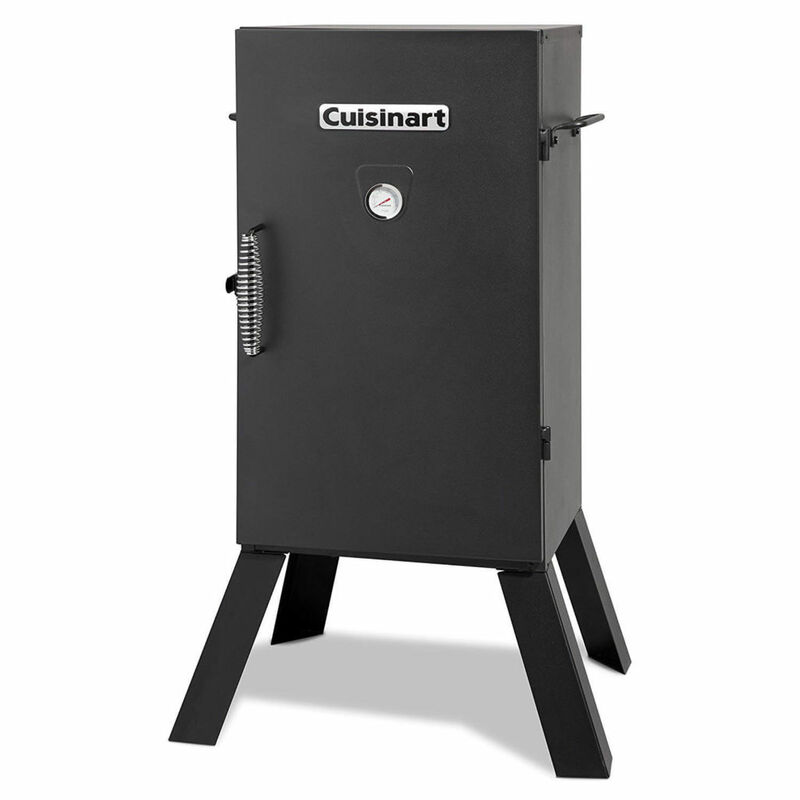 Don’t run out of space again with this electric smoker as it boasts 548 square inches of interior cooking space with three removable chrome racks that can be arranged and rearranged to fit in cuts of meat of all shapes and sizes. Simply plug in the smoker, adjust the temperature add the water bowl for extra juicy meat and more intense flavor and let the smoker do the job for you, now you can spend more time chatting to your guests and finish off that baseball game in the backyard that you have been promising the kids you would join. Now that’s summer sorted. Ease of transport. 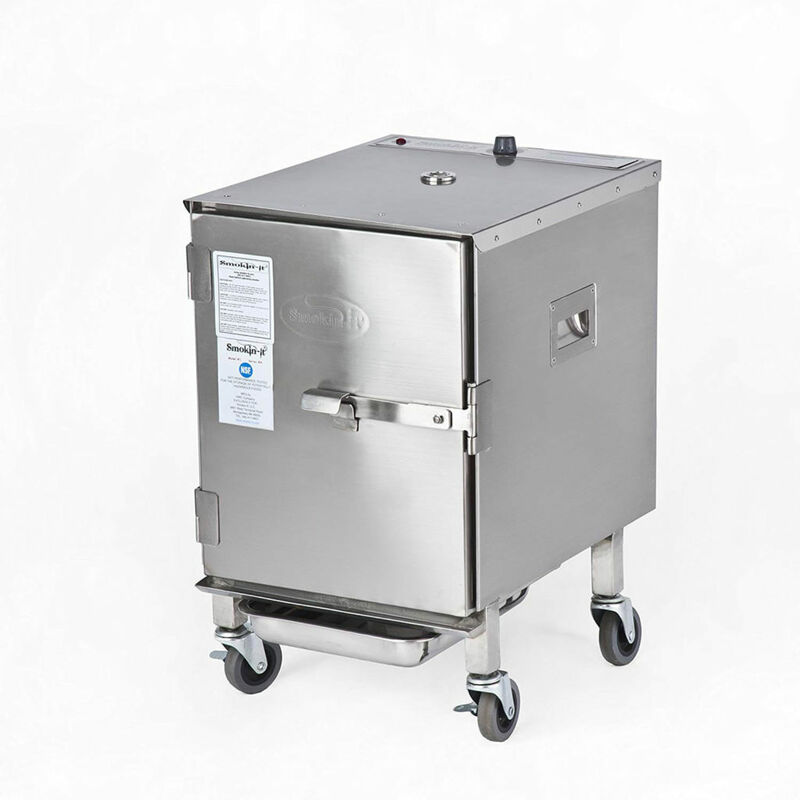 Find a smoker that is easy to move around that is on wheels or has a handle. Choose a model that has collapsable legs if you are thinking of taking your electric smoker on trips in the back of the truck. Cooking space. 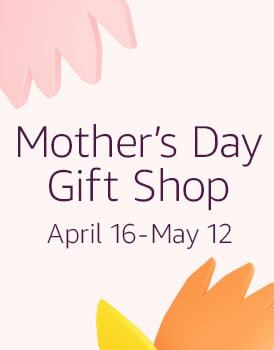 Make sure there is enough room on the racks for you to be able to provide for the whole family. Remote temperature control is really handy for you to be able to increase or decrease the heat at the touch of a button. Water. Make sure the smoker has a water bowl as this makes meat cook up more succulently. These are just a few tips and things that I look for when choosing an electric smoker, I hope they have been helpful to you. Ready, set, smoke!